Balance to be paid 6 weeks prior to holiday commencing. Plus a £50 Damage/Loss retainer is required, which is refundable at end of letting, returned within 2 - 3 days of handover of the keys. 7 NIGHT BREAKS (or more days if available) PRICES upon request. Please state guests and children's ages. Situated on a peaceful part of the 5* Haven Hopton Holiday Village, yet only a short walk from the Entertainment complex. A spacious area and ideal too for the Golf lover.We have our own driveway and a lovely patio area for you to relax. 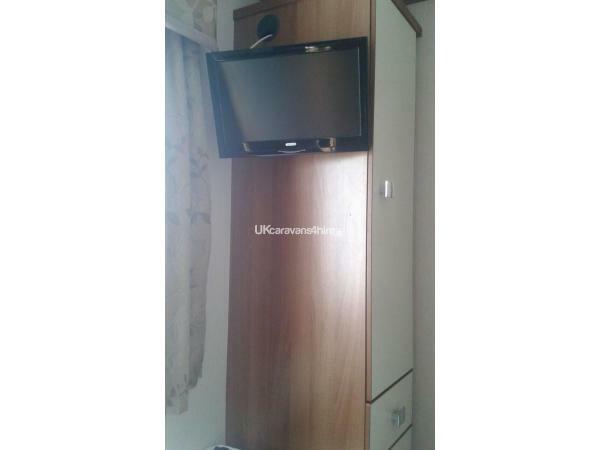 Our caravan consists of a very spacious lounge with a 32inch flat screen television. A Blue-ray DVD with a varied selection of assorted DVDs for all ages. A modern fitted kitchen complete offering MAINS GAS with a large built in double fridge/freezer plus all necessary kitchen utensils. slo-cooker. Tea, coffee and sugar are also provided together with t-towels and hand towels. 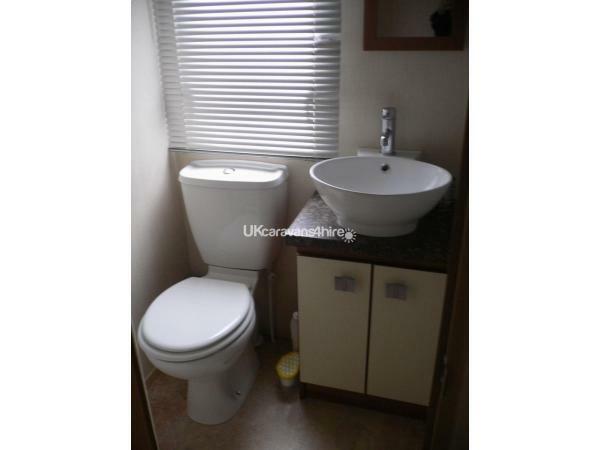 There is a shower room with shower, sink and toilet, plus a separate toilet with a small wash basin. TOWELS ARE PROVIDED (HOWEVER YOU ARE REQUESTED TO BRING YOUR OWN POOL/BEACH TOWELS). Main bedroom, comfortable double bed with storage drawers. 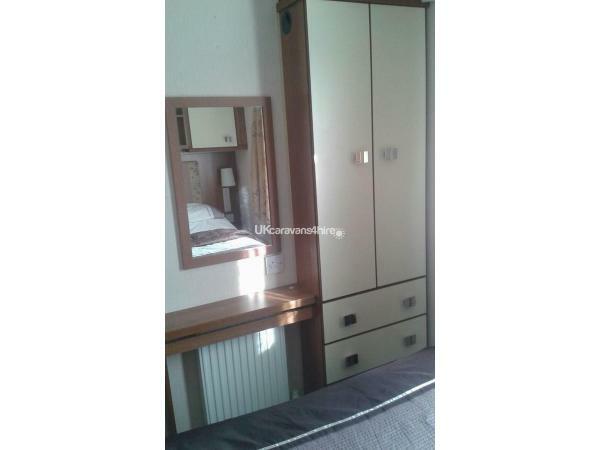 Wardrobe with drawers, overhead cupboards. Side cupboards with overhead lights. The two further twin bedrooms, with single beds, both have a TV that has built in DVD and Free view. Bedside cabinet, overhead lights. Both rooms have overhead storage, wardrobe and drawers. The beds can be pushed together to make a double if required, topped with a thin double memory mattress. ALL BEDDING IS SUPPLIED AND BEDS WILL BE MADE UP PRIOR TO YOUR ARRIVAL. There is a barbeque available to use plus a sun lounger to relax. There is a 9 hole 3 par, golf course and clubs are available at the caravan. Within easy reach of Great Yarmouth, Lowestoft, Somerleyton Hall, Pleasurewood Hills Theme Park (10minutes drive), plus many more popular places to visit for all ages, the location of our static caravan is an ideal choice for a holiday and proves to be popular as we have guests who return to book with us. Just on way home from a fabulous few days. Was 7 of us, 3 kids (7-4) and 3 sisters and mum.. We all loved the caravan, had everything we needed. Lovely quiet corner plot. Nice green area for boys to play out in safely. Hardly any traffic. Nice patio area. Was my 3rd trip to Hopton and I just love it there and think this part of site is my favourite. We will recommend this van and already looking at future dates. Thanks to Sharon so friendly and helpful. We had a lovely couple of days stay in your caravan which was very spacious, clean and homely. It was situated in a lovely quiet spot near the golf course. Booking was made very easy and Sharon replied very quickly to any queries we had. We would definitely like to return. Thank you, Debbie, Steve and Sarah. We stayed at Robert and Sharon’s caravan for a week with our two young children. The caravan is perfectly situated in a quiet area of the park with space for children to play safely nearby. It’s still a short walk to the centre for activities. The caravan was perfectly clean and setup for everything you could need. Dealing with Robert and Sharon was a pleasure and they made the whole experience easy and straightforward. I would highly recommend it. just back from another lovely holiday at Sharon and Roberts caravan at hopton, its like going from home to home, everything you could want is in caravan, we had hot weather but we didn't venture to using the B B Q but it was available to us , did enjoy soaking the sun up on the lounger, very quite part of the site nice walks around site and down to beach,. Thank you Sharon and Robert for all your care and attention from the time of booking such caring people and your caravan is spotless, can't wait for another return visit next year hopefully. Well, what can we say, yet another amazing stay at Sharon and Roberts caravan. Right through from the booking process, to our actual holiday was extremely easy. Very well looked after van, extremely clean and spacious, with all the added extras.... Home from home. We just love it here, and will be back again next year for the fourth time! Very happy family and fond memories made. What can I say. Sharon was the most wonderful help in arranging our stay in her beautiful home from home . Everything you could imagine needing was there and more. Was lovely that beds were made up ready just one less job to do when you arrive. We love the park at hopton and as always it didn't disappoint lots to do and very well maintained. I would definitely book with Sharon again she truly was brilliant and kept in touch throughout. This was our second stay at Sharon and Roberts caravan and It was still at the high standard of the first visit. The caravan was spotlessly clean throughout, beds all made and waiting. The lounge and kitchen areas are large spaces offering ease and comfort for the family. High quality table and chairs outside and plenty of green space to relax in. Sharon was in constant contact leading up and during our stay and we couldn't have asked for more. The site itself is fantastic, the caravan is perfectly placed for golf and quick on foot access to the main complex and the beach. It goes without saying we will be back. Thank you Sharon and Robert. Once again we have had another fantastic long weekend staying at this Caravan. The caravan is in a great location, nice and quiet and only a 5 minute walk to the club house and beach. The caravan was lovely and clean and has all the facilities you would expect. The site is great, nice pool indoors and out. Sharon and Rob as always are extremely helpful and always willing to help with any issues. Overall a lovely stay and looking forward to coming again next year. Once again Robert and myself are so pleased to know that you and your family enjoyed staying in our caravan and would like to thank you for your review. Since updating kitchen area with a new freestanding table and chairs we also have changed outside bench table to a 6 seater wooden table and 6 chairs. All ready for our new and returning guests, when eating alfresco. 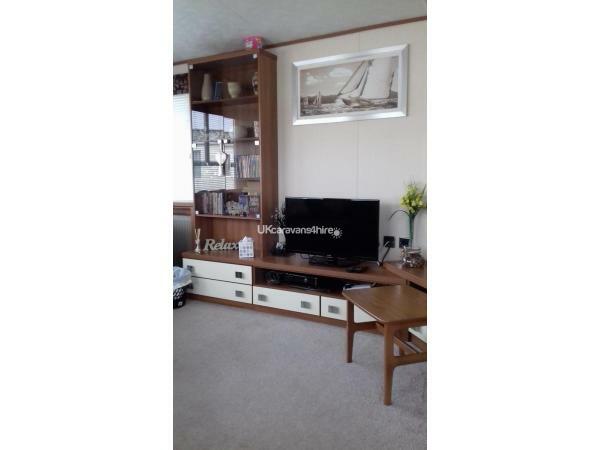 Sharon & Roberts Caravan is spotless, in a really nice quiet location. It has many little extra s and we cannot fault it or their hospitality in any way. They always make you feel welcome and go out of their way to add that extra special touch.. We have stayed here on many occasions and look forward to our next visit,. Fourth time at the park but first time at this caravan. Situated in a nice quiet area right near the duck pond & lovely nature trail. The caravan was spacious, very clean, comfortable & very homey. The owners have thought of everything, dvds, books & games. We were fortunate to meet the owner Sharon & she made us feel very welcome. Thankyou for a lovely break & hope to be back. First time not directly going through haven, have been coming to hopton for the past 10 years and this is one of the best caravans we have stayed in the process was made quick easy and very friendly by Sharon and all the added extras made a big difference, the caravan was spotlessly clean and could not fault it in any way, we look forward to booking again with you again in the future thanks for our stay, Ross and Lydia. This is our second time booking this Caravan. The van is very well equipment with everything you need. Upon arrival the Caravan was found extremely clean and nicely presented with all the beds made to your configuration request. The Caravan is sited on a lovely quite site with virtually no site traffic which is great if you have kids. The park overall is very well maintained with great facilities. Sharon could not be more helpful. She is very conscientious on customer satisfaction has great communication and genuinely would like you to have the best experience during your stay! This is our caravan of choice for our breaks in the GT Yarmouth area. You will not be disappointed! We have just returned from a weekend in Sharon's caravan with our four Granddaughters with a promise that we'll return next year! The caravan is lovely, very clean and well equipped. It is in a perfect, quiet location with a grass area for the children to play. Having the beds made up and towels provided is a real bonus. Sharon was very helpful and informative and made the booking process easy. Will definitely recommend to family and friends. Had a great time. Easy to deal with and book. Clean, lovely caravan. Kids absolutely loved it. Love the fact there were some DVDs and books, you would not get bored. Would definitely recommend. From the initial booking process, to arriving at the caravan we were very impressed with the customer service we received from Robert and Sharon, and of course , Nicky and Sophie too. Nothing was too much trouble and everything was so easy. The caravan was in a beautiful, quiet place on the park, spotless, had everything we needed, and more, including beds made up on arrival, towels, tea, coffee, sugar, and all the little extras, DVDs ,and use of anything that was in the caravan. We had the most amazing holiday , we all loved it, the most amazing weather , and we will not hesitate to rebook for next year with yourselves! Kids did not want to leave! Keep up the good work Sharon, and keep in touch , your caravan is a credit to you. We had a fantastic time spending a long weekend at Hopton. The caravan is in a perfect position on the park, close to the golf course and very quiet, but a walkable distance to the main complex. Sophie did a great job in making the caravan as spotless as possible and it made a big difference in having our beds already made up on arrival. We had a slight issue with the carbon monoxide alarm but Sharon rang me immediately and promised to have it rectified straight away. Booking was made easy and Sharon replied immediately to any queries I had leading up to our holiday. There's loads to do on the park for adults and children. We really recommend visiting Bewilderwood which is about 45 minutes away. A great day out for the kids and the adults enjoy it too! We had a lovely time, in a lovely caravan, in a great park. Definitely would look to book again. Thank you Sharon and Robert. 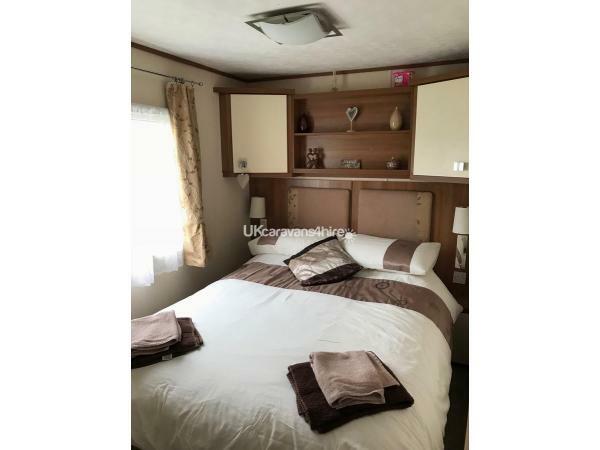 Sharon and Robert have a really great caravan on the quieter Golf Village part of Hopton, it's a ten minute stroll from the entertainment and pool but worth it as we weren't looked in on or walked by all the time, small play area nearby and a duck pond. From the beginning Sharon was extremely helpful, never minding the odd extra question and keeping us informed during the booking process of what was going on and what to expect when etc. On arrival it was clear the cleaner, Nikky, does an extremely thorough job. Spotless, warm and welcoming - we had cold and extremely windy weather over Easter but were as warm as toast thanks to the central heating throughout and fire in the spacious living area. Toilet rolls,hand soap, tea towels, towels, washing up liquid and lots more in the well equipped kitchen should you need it. Beds all made up and a comic for our son. If the weather had been kinder we would have made use of the outdoor space to sit out, maybe next time! Thanks ever so much Sharon and Robert - a relaxing stay. I booked this caravan for a special birthday weekend away with friends. From the moment I booked it Sharon was the most kind and helpful person I have dealt with while booking a holiday. On arrival I was surprised with a lovely birthday card and present from Sharon and the cleaner, which really was a lovely thought. I have stayed in many caravans before but this one was perfect, home from home clean tidy with the little extras really make it a great stay. Having bedding and towels provided is a great bonus. The caravan is set in a lovely quiet part of the park which is very spacious and had nice surroundings. I can not recommend this caravan enough it really was great and at a brilliant price. I would just like to thank Sharon, Robert, Nicky and Sophie again for all the hard work you do to make each stay welcoming. We have just got back from a weeks stay at Robert and Sharon's caravan. The caravan is in a lovely quiet area of the park not a lot of noise in the area. The caravan itself if beautiful, lots of space in the lounge area and the beds are not the normal caravan beds which you get from haven themselves, they were quite firm. The booking process was easy and Sharon could not have been more helpfulike and imformative. The park itself is big,the beach which only re opened in March 2015 looks really good now, they have made mini bays within the beach they have done a really good job on it. Thank you for a lovely stay in you caravan. 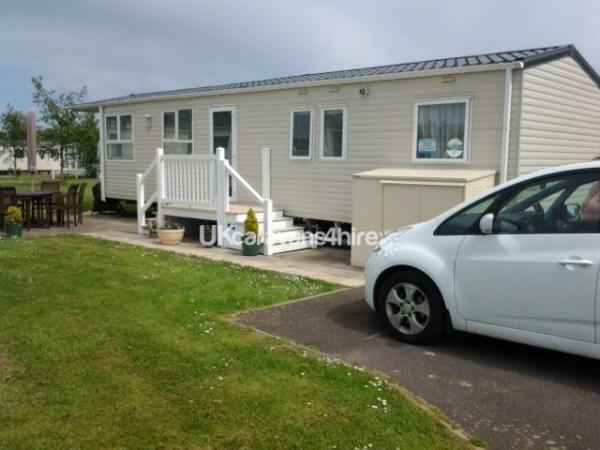 This caravan was one of the best I have stayed in at Hopton and have been going for 15 years. 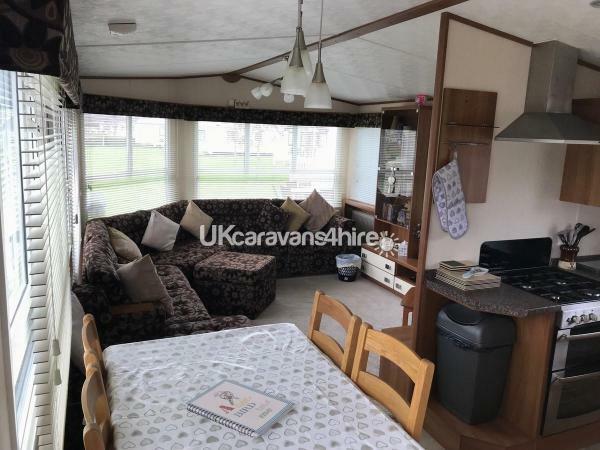 Modern,clean and has everything you could want for a great holiday, the owner Sharon could not of been more helpful and I would 100% recommend this caravan to any one. Caravan was perfect and you get so much more for your money. It felt really homely and was very spacious. Made such a difference having the little extras like towels, tea and coffee. The TV in one of the twin bedrooms was ideal for our two young girls and great having two toilets. The position of the caravan was lovely especially at tea time with the sun setting. Would definately stay again. we have stayed at Hopton many times, and this is one of the cleanest, nicest caravans we have stayed in. 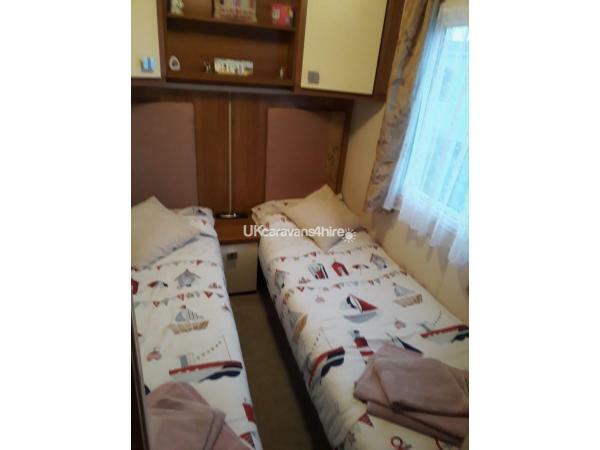 Having beds made up and towels provided is a nice bonus, and the caravan is very well equipped with everything you could possibly need, a real home from home. 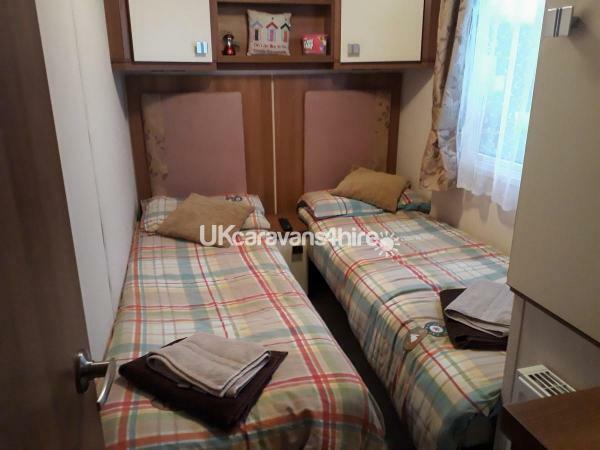 The caravan is situated in a lovely area of the park (golf village) which is quiet and relaxing, but just a short walk from the park amenities and beach. If you are looking for a very well appointed caravan for a very reasonable price on a top class park then look no further! Robert and I are so pleased that you had an enjoyable stay! We do try to make it easier for your enjoyment whilst staying in our caravan. This is achieved by having two lovely people who look after our caravan and make such an excellent job in what they do. A holiday should be happy memories and we are glad that you enjoyed yourselves! We stayed for a long weekend in Sharon and Roberts caravan. Our family consisted of one child and four adults. There was plenty of room for all of us, the caravan was spotlessly clean and in a fantastic location. The inclusion of linen, towels, tea and coffee were nice extra touches. Our son was very excited to have a TV in the bedroom and the bonus for us was he was able to watch a different channel to us in the lounge. The position of the caravan near to the golf course was great and had we stayed for longer my father in law would have taken advantage of the clubs available at the caravan to play a round of golf. Our son could safely play on a nice grassy area right next to the caravan. 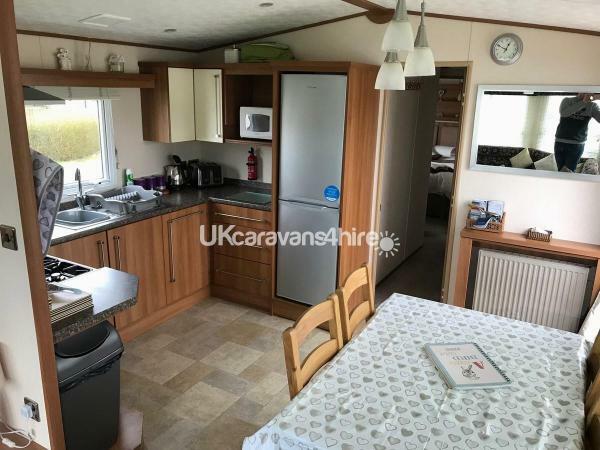 The site itself is lovely and we wouldn't hesitate to book Sharon's caravan again and would definitely recommend it to anyone wanting a high specification caravan in a great quiet location. I went with a girl friend, we were just looking for a lazy week to chill out and recharge our batteries. The site was excellent, very clean and the staff were very friendly and accommodating. The caravan was prefect, a real home from home, clean, spacious and had everything we needed. Ideal for us and also for a young family or a group of friends, especially if you like a round of golf. The caravan is not situated surrounded by hundreds of others like some caravan parks are, here you can see the golf course and there is a lovely lake close by. There is plenty to do, a swimming pool, entertainment, coffee shop, restaurant and even takeaways. I liked the fact there was a large outside seating area, where you could curl up with a book, catch the sun and be in the vibe of what's going on. It's a great place to chat with other holiday makers. There is a lot to do in the area, we were quite lazy, which was the intention. We went into nearby towns for lunch and browsed around. We had meant to visit Somerleyton Hall but ran out of time (our fault, we were too chilled) but I noticed there was lots around the area if you had a young family with you, for example Afica Alive and Pleasurewood Hills. We had a lovely time and definitely give it the thumbs up.